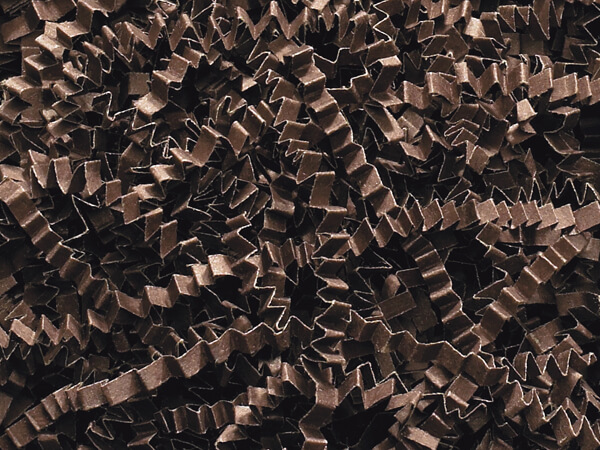 Chocolate Crinkle Cut™ Paper Shred (Zig Fill). Actual shred size is 1/8" and sold in 40 lb. cartons. Made from 100% recycled paper. Green Way® Eco-Friendly Packaging. Made in the USA. Note: Product ships as Dimensional Weight of 92 LBS due to volume of carton (18" x 24" x 41"). Our gift basket paper shred comes in all the colors of the rainbow. It is perfect for Easter baskets, basket box filler, and nested box displays. Use shred with our gift basket benches for additional support. Each shred measures approximately 1/8" wide. The crinkle style gives this shred the strength to support medium to heavy weight items. All of our paper shreds are proudly made in the USA.